After 2 back-to-back BBQ lunches to start our vacation in Texas, we were a little meated out. 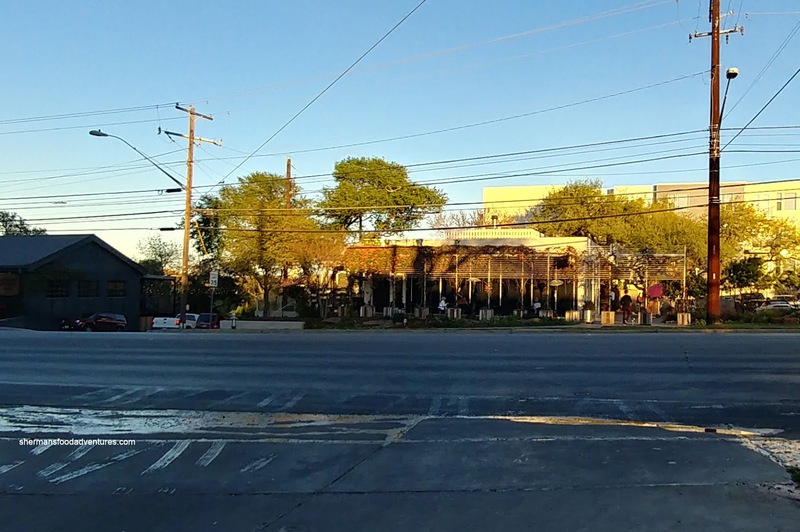 To top it off, we had dinner at Knife Steakhouse the first night and continued to eat more meat at Lonesome Dove the next. Hence, we really didn't eat lunch, giving way to kolaches at Czech Stop. For dinner, we wanted to go for something completely different. 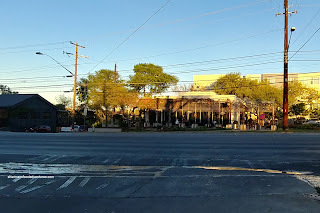 Even though we had the Chinese food urges, we refrained and decided to head to Odd Duck (on recommendation from Melody). 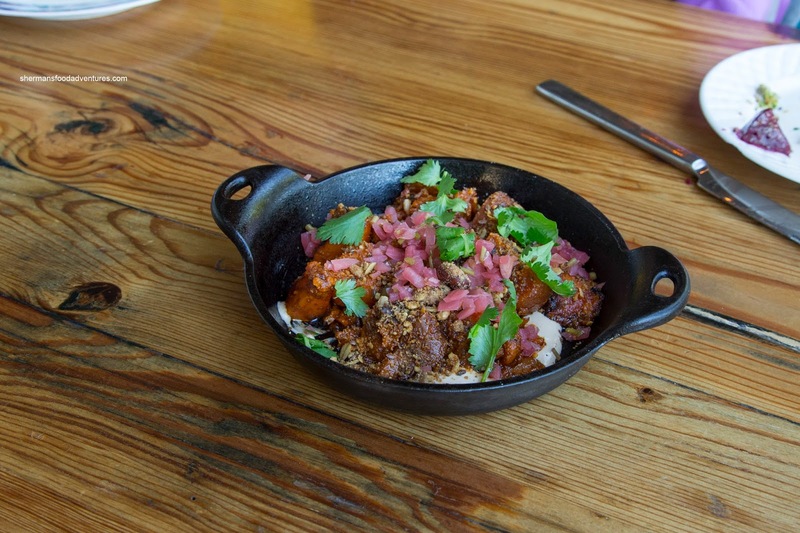 Their take on farm-to-table cuisine sports some interesting menu items. We arrived in time for happy hour and proceeded to order some of the specials including the Pretzel filled with shiitake chorizo and accompanied by masa mustard. This was pretty tasty with the unmistakeable pungent earthiness of shiitake combined with some spice. 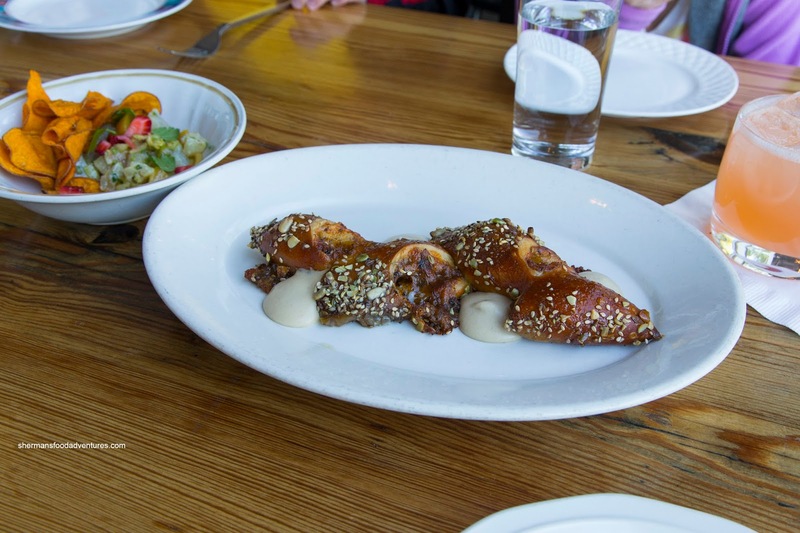 The pretzel itself was chewy and nicely spiced with fennel, caraway and sesame seeds. Finally, the mustard had a nice tang that helped brighten things up. 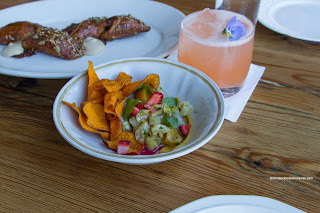 Next, we had the Redfish Ceviche with tiger's milk, beets, olives, sweet potato curry and yam chips. The cumin from the curry really stood out and created aromatics to the dish. It was complimented nicely by the sweet and slightly tart beets (and the juices). I thought the fish was a little lost in this, but we didn't mind as the flavors were impactful. 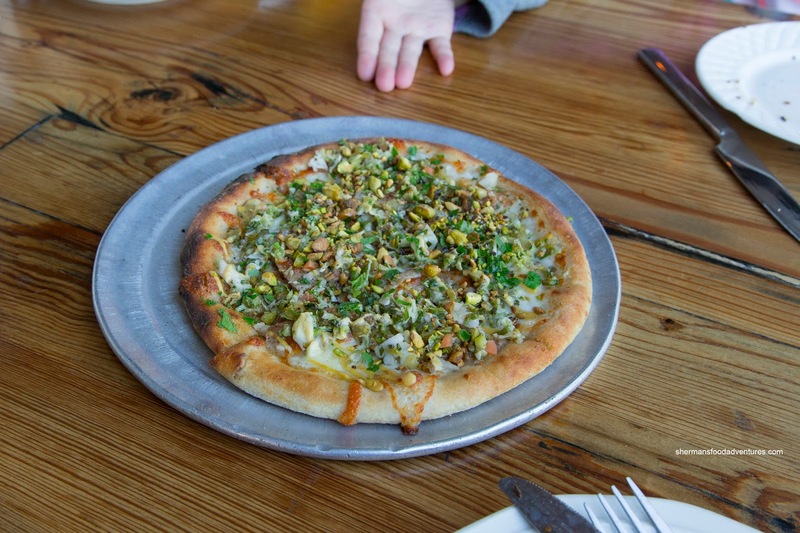 One of my favorite items was the Muffaletta Pizza featuring house-made mortadella, olives, capers, brussel sprouts, onion and pistachio. Crispy and slightly chewy, the thin crust held up to the wealth of toppings. I particularly found the meaty mortadella to be almost sausage-like. It was complimented well by the tangy and salty olives and capers as well as the nuttiness from the pistachio. Although a fairly simple dish, the Oven-Roasted Sweet Potatoes were intensely tasty and delicious. They were caramelized to the point where the natural sugars were completely activated with depth and smokiness. It was served with whipped cajeta which made for an added layer of smoky sweetness while the pecan pork fat crumble afforded crunchy aromatics. Yet another seemingly simple dish in the Roasted Beets resulted in layers of flavor that were pronounced. The beets themselves were tender with a bite being slightly earthy, but more tangy and sweet. Graced with a black bean mole that was thick and slightly spicy, there was also notes of chocolate and peppers. Combined with the residual beet juices, there was a great mix of sweet, tangy, spicy and umaminess. 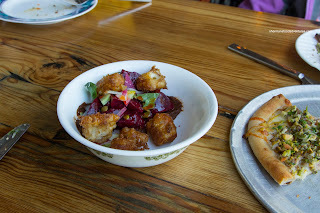 Adding crunch and just overall awesomeness, the fried cheese curds were a real treat. I found the Sunny Duck Egg with smoked duck, sweet potato tots, giardiniera and creamy buffalo sauce to be a bit hit and miss. The perfectly prepared egg was runny with tender egg whites, but the duck was a bit chewy. 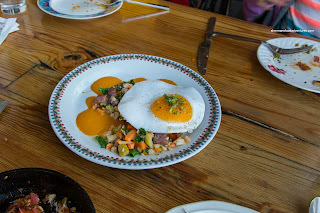 Loved the tanginess of the giardiniera as it helped lighten the dish. 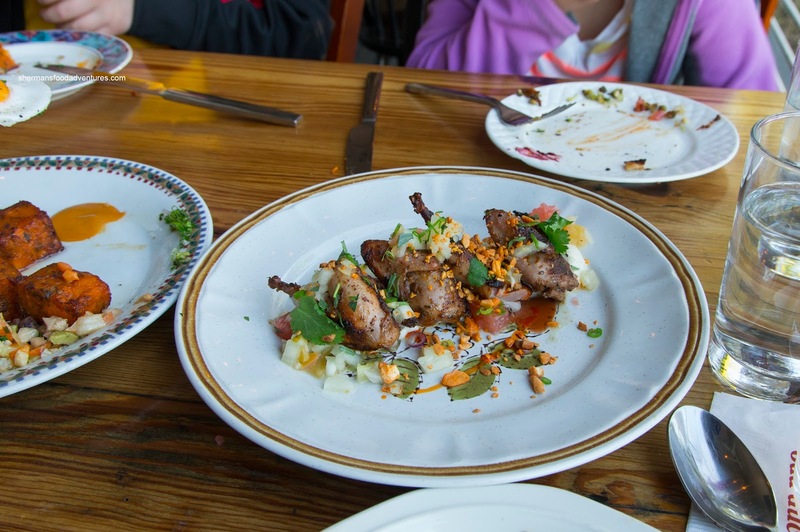 Our last plate consisted of the Grilled Whole Jerk Quail with green tomato, toum and spiced cashew. Sporting nicely rendered and charred skin, the quail itself was well-seasoned and spiced. However, the brine was a little aggressive where the quail was rather salty. 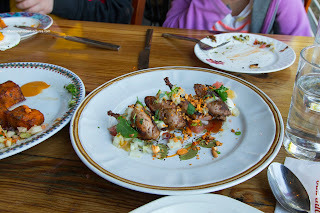 I thought the garlicky toum to be a good compliment to the quail as well as the tangy green tomato. Overall, we enjoyed our meal at Odd Duck due to the creative and composed dishes. Sure, some dishes had some hiccups, but they were not the norm.